Analysis In the 1990s, Intel and Microsoft dominated the "open" PC standard – and it appears that Google now wants to do the same for its Android system, via its Silver programme. Silver has yet to be announced, but industry sources have confirmed the details to us. While the comparison between Google today and Wintel then isn’t perfectly analogous by any means, Google’s move is likely to have a few similar consequences. The Silver programme reduces the incentives for smartphone brands to diversify from a strict set of rules laid down by Google, for example. After 1990, chipmaker Intel increasingly set the standards on what hardware people should use, while Microsoft's market share meant it could dictate what the bootup and desktop should look like. Of course nothing we have heard about Silver suggests that Google will dictate what hardware an Android phone-maker should use – which is just as well given the vigorous competition between Qualcomm and Mediatek, and Samsung’s huge investment in its own semiconductors. However, Google will decide what the software should be, and the penalty of going alone will be lower margins and lower visibility at retail. This presents an unenviable choice for a smartphone maker today: double or quits. The consequence of the Wintel grip was that once-mighty PC companies like Compaq – and they weren’t mighty for long – became hollowed out. The brands became little more than badges on a box, the box being made in Taiwan by somebody else, typically Quanta Computer. The PC maker was reduced to performing menial office chores: performing the logistics and fulfilment and taking in the returns. So higher risk at lower margins, then. That’s exactly the choice that will soon face Silver refuseniks. Once the Wintel duo began to set the standard, PC companies no longer had the incentive to differentiate – even if they wanted to. In 1990, PC companies thought they could add their own skins or shells to Windows. 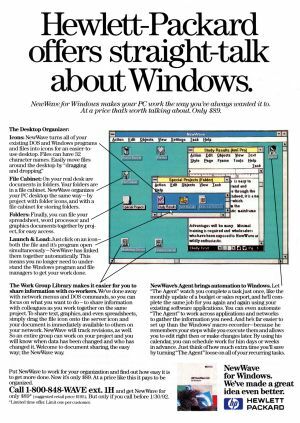 HP invested a lot in a clever shell called New Wave, which ran on top of Windows 2.11 or 3.0, in much the same way as premium Android smartphone-makers today try to differentiate by creating their own shells, such as Samsung's TouchWiz or HTC's Sense. But, going back to the '90s, the PC companies couldn't entertain such ideas for long. With Windows 95, Microsoft dictated the “Windows experience” much more tightly. For its part, Intel attained PC makers' loyalty through substantial sweeteners - MDFs, or marketing development funds. Originally created to promote the Intel brand and keep PC makers from switching to AMD, by subsidising marketing costs, MDFs became a very flexible tool. In one year, a class action lawsuit subsequently disclosed that 38 per cent of Dell’s operating profit had come from MDFs. Yet even MDFs didn’t help. By the mid-noughties most rivals had dropped out of the PC market, or merged with others. Even Dell itself – the most loyal Wintel PC maker and the most efficient box-shifter – became a casualty. It lost its No 1 spot, diversified into services by buying Perot Systems, and went private last year. Google’s Silver is also an attempt to steal ‘brand equity’ from PC makers. In their own ways Sony and HTC have built up strong reputations in consumer electronics. Silver creates a premium standard – a kind of quality kite mark. So we can expect to see mobile operators or even supermarkets making ‘Silver-standard Android’ phones. This is no doubt part of the calculations, just as it was with Wintel. With Google controlling the show from behind the curtain, the costs come down and the market grows. With Silver, Google de-risks Android at a fairly low cost to itself. That’s the case for Silver. Next page: Who loses and who wins?